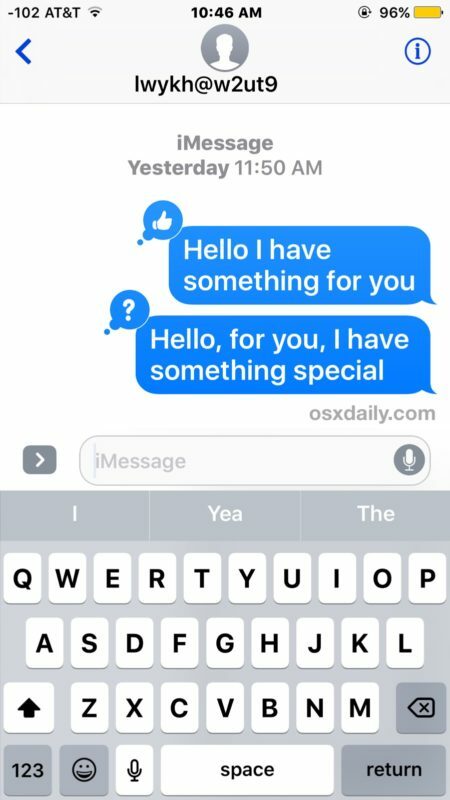 Modern versions of iOS have all sorts of fun new Messages app features, including the “Tapback” function which allows you to insert an inline response as a visual icon to any message with a quick action. Much like using iMessage Stickers, the Tapback message icons are applied atop a message, appearing inline within the conversation. To use Tapback in Messages, you’ll need a modern version of iOS on the iPhone or iPad. This means anything beyond iOS 10.0 will support the feature, so be sure you have updated if you want to use Tapback. If you can’t get the tapback message effects to work at all, first you should be sure that you are on a modern version of iOS, and then you can try some troubleshooting tips if iMessage effects are not working, which tend to apply to the tapback and broader effects as well. 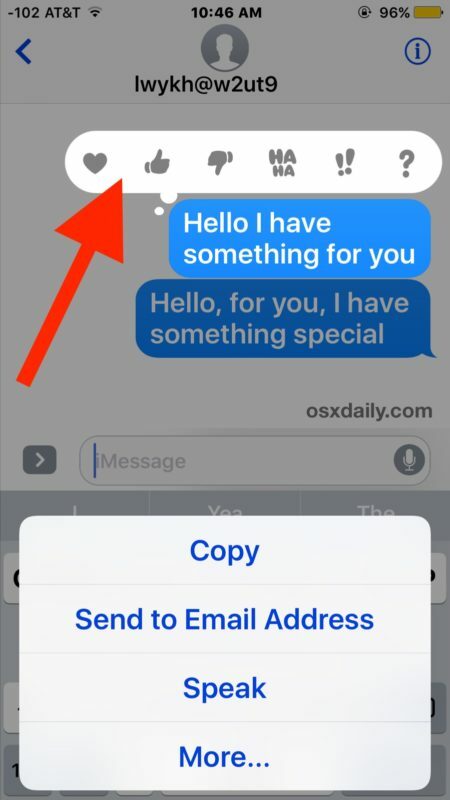 Interestingly, the Tapback feature is one of the only new Messages app features that spans across platforms and has complete functionality and support both on iOS and MacOS. This means you can send and reply with Tapbacks on either Apple OS platform. 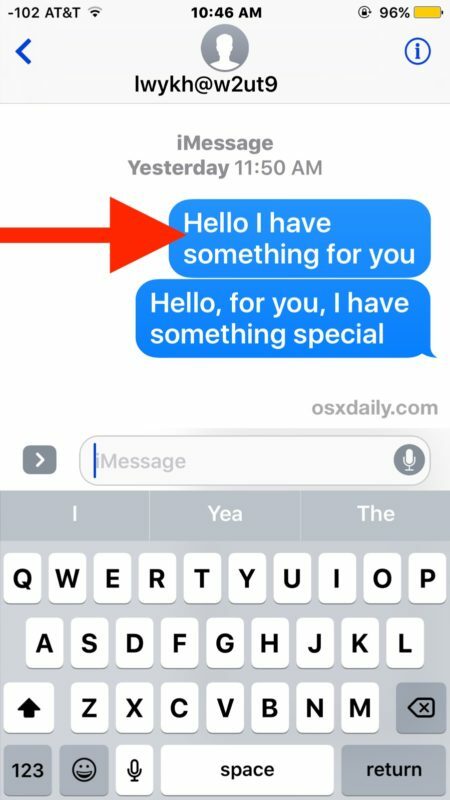 This is just one of a variety of fun new iMessage features introduced with iOS 10 for iPhone and iPad users to have fun with, others include the ability to search and send GIFs in Messages, create handwritten messages, and even an ability to slap Stickers on imessages. Have fun and explore the features, they’re a real joy! This works by just quickly tapping twice on the message too…. Yes, I’m known as a wise Tap Backer…. Why are such devices like iPads and iPhones, which are promoted as communications and data access tools, turning out to be nothing more than toys? Actually, they are promoted as both tools and toys. That’s the cool thing about general purpose computers–they have more than one possible use. My main interest here is how NOT to use it by mistake. This is a nice feature, but only if it doesn’t work when I don’t want it to. I believe the “toyification” of the Mac should stop. I’m beginning to feel like everything is designed for fourth-graders, from the UI that looks like an extraterrestrial circus-poster to renaming the Character Palette to Symbols & Emojis. This reminds me of the horrible little animated “cute robot” that started showing up in Microsoft products when that company lost its way. Apple used to treat customers as people with aesthetic self respect. I do not want to see horrible little ?s and Hahas. Ever. Make this disableable. I’m not in 4th grade either.